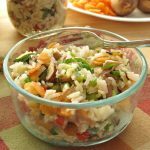 Vegetable Rice Pilaf Recipe – Make ahead tips! 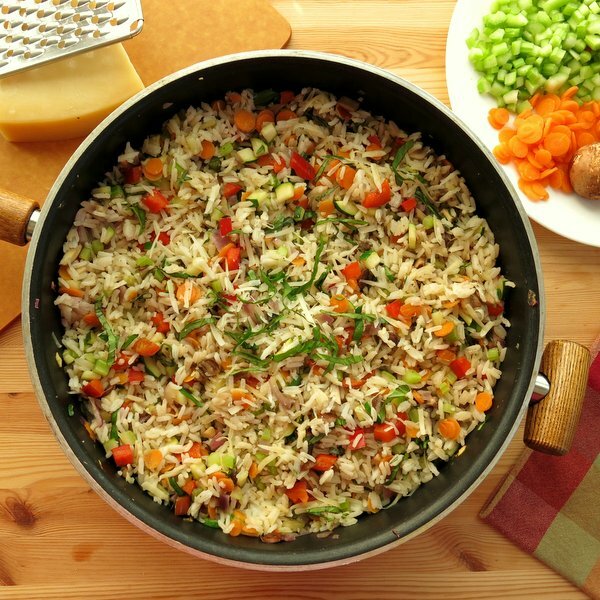 Fill your refrigerator AND freezer with colorful Vegetable Rice Pilaf and you’ll always have a healthy side dish for your delicious dinner! Or, it can take center stage as a rice bowl by adding your protein of choice! This recipe is a variation of Cajun Dirty Rice. Basil and thyme replace Cajun spices. Both recipes are delicious. Another favorite we often enjoy in the winter is Farro Pilaf with cranberries and walnuts! Cook rice on the stove-top or in a pressure cooker. Typically, long grain rice is used, like Basmati or Jasmine. Can you use regular brown rice? Absolutely! We used vegetable broth instead of water to add more flavor. 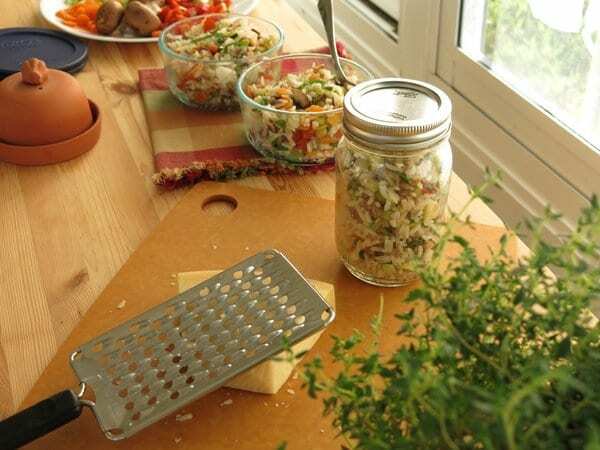 Finely dice and saute vegetables. We used carrots, onions, celery, peppers, and mushrooms. Add whatever is in season. This rice pilaf recipe stops here and uses easy to find ingredients that you may have on hand. 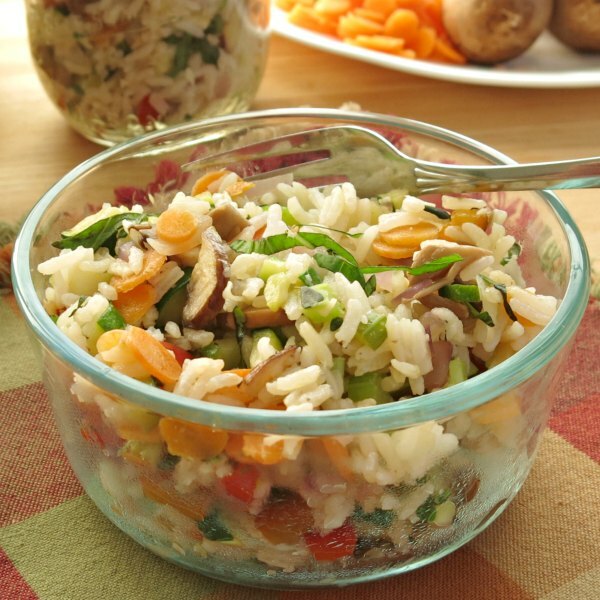 However, you can top vegetable rice pilaf with nuts, dried fruit, or other fresh herbs too. And, cheese. Parmesan cheese is optional…except at my house! My vegan daughter adds nutritional yeast instead. Cook once and eat twice…or three times is always my game plan. Double or triple the recipe. It will take the same amount of time to make extra rice, but you’ll have to spend a little more time chopping. Since you have everything out, it’s really not that bad. And, totally worth it! It’s the same thinking we use for Homemade Vegetable Soup! This batch of vegetarian rice pilaf went straight to storage. Pictured is my assembly line of mason jars and glass bowls. Since I’m having a bit of luck with growing thyme these days, I brought this herb inside for the event. The rice bowls or jars will keep nicely in the fridge for about 3 days. Any extras beyond that can be frozen in plastic bags or containers that freeze. When you are ready to enjoy the frozen rice pilaf, defrost it in the microwave or overnight in the refrigerator. When you’re ready to heat up the vegetable rice pilaf, add a little broth or water to moisten it before you heat it up. For a single serving, I only add about a teaspoon of liquid. 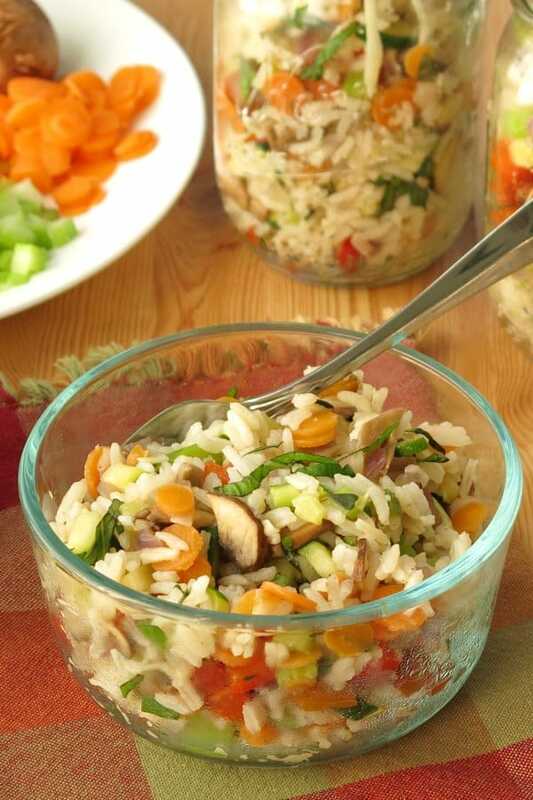 Peace of mind is having jars of this vegetarian rice pilaf tucked away in the refrigerator or freezer and ready to serve. 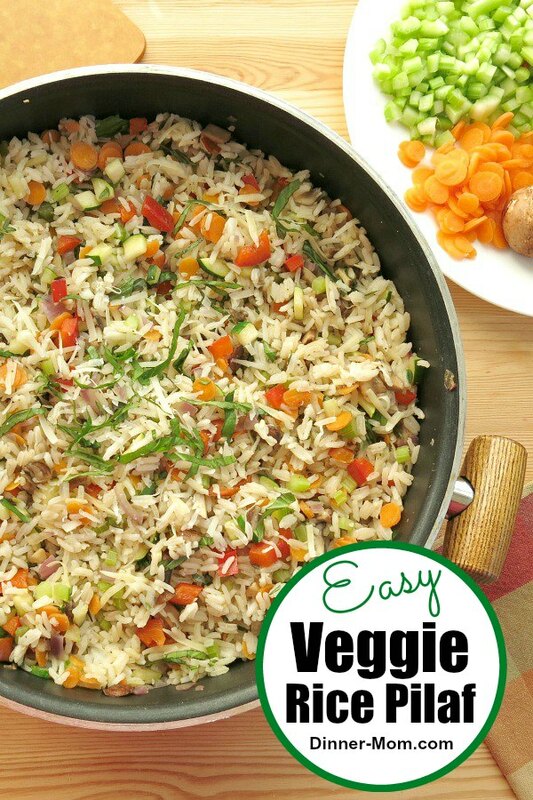 Vegetable Rice Pilaf can be made ahead of time. Peace of mind is knowing that you have this healthy side dish in the refrigerator OR freezer. Cook rice according to instructions using broth instead of water. Rice should be light and fluffy and all the broth should be absorbed when finished. Heat olive oil and butter in a large pan. Add onion, celery, carrots, pepper, mushrooms and garlic to pan and saute until soft, about 5 minutes. When rice is finished cooking add it to the pan with the vegetables and mix to combine. Stir in thyme, salt and pepper. 1 teaspoon of dried thyme leaves and 1 Tablespoon basil substitutes for fresh herb amounts used. This rice pilaf is so perfect for summer! This is totally my kind of pilaf! Love all the colorful veggies in this delish dish! Made this last night. This was so good. and very easy, as the name says. It pretties up a plate too! I used veggie broth to make it eatable for our whole family, and would add salt and pepper to taste next time. Thanks for a good recipe!Will be making this often. As my son has an issue with onions, I substituted a couple pinches of Asafoetida Raw Herb. Also substituted fresh broccoli as I didn’t have frozen peas and carrots. Thank you so much for this recipe. 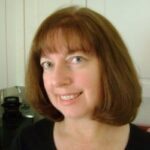 Looking for recipes that art free of gluten, egg, dairy, sugar, corn and onions. Hard to find. I’m so glad you enjoyed it. I need to check out that herb!